alaTest has collected and analyzed 43 reviews of Flip Mino. The average rating for this product is 4.3/5, compared to an average rating of 4.0/5 for other Camcorders for all reviews. Opinions about the image quality and size are overall positive. The price and portability also get good feedback, but there are some mixed reviews about the durability and battery. Some have doubts about the reliability and zoom. We analyzed user and expert ratings, product age and more factors. Compared to other Camcorders the Flip Mino is awarded an overall alaScore™ of 85/100 = Very good quality. We've seen the Ultra, now here's the Mino - a slimmer version of Flip's pocket camcorder. Flip's Mino is a tiny camcorder, measuring only 100x50x16mm. A minor improvement over the Flip Video Ultra, but an improvement nonetheless, the Flip Mino is a fun camcorder, until you realise you want your home videos to look the bomb. Cheap as chips -- but is it cheap enough? 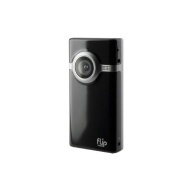 With its rechargeable battery and ultra-sleek design, the Mino is probably the best Flip cam yet. However, with an RRP of over $300 it is perhaps a teensy bit overpriced for what it offers. ...if you're buying it for yourself as your primary camera, spend a little more and get something different. When it comes to YouTube-friendly pocket camcorders, the Mino is king, but for a price. Last year, I came across the Flip Mino, a tiny camera with a great sense of style. Read my review!